Upfile Administrator Live! is our ASP software product that is currently under development. It is specifically designed to run from the Internet and is not installed on the user's computer. Administrator streamlines management of, and communication with, an organization's members, clients, contacts, and others. Administrator also incorporates a comprehensive suite of modules that can handle accounting, financial transactions, sales, fund-raising, registration for events, and other tasks. The program's web-integration features provide the ability to publishing data to the web (eg: online member directory) and for data-collection via the web (eg: members can sign petitions and initiate surveys). Click here to view a prototype of Administrator Live! Administrator Desktop is a desktop application that runs under any version of Microsoft Windows. 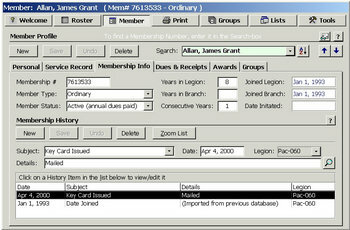 It is a membership and management application that has been customized for use by legions and similar organizations. 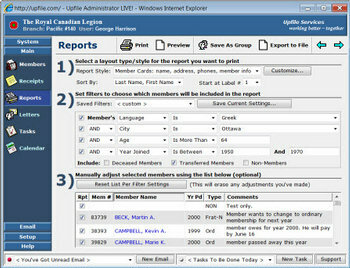 Administrator Desktop integrates all their membership needs, and provides the ability to create thousands of different reports, in addition to labels and mass emails. This product has been in use by over a hundred clients since 2000.